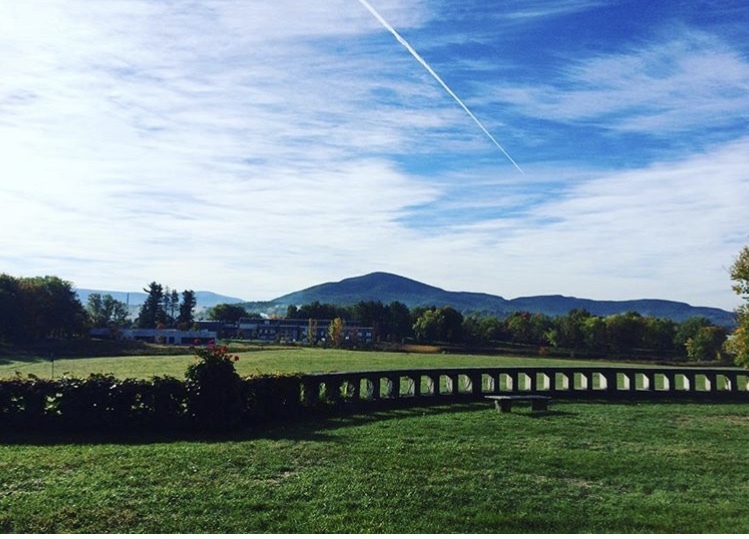 Bennington College view from Jennings. Courtesy Nam Phuong Doan '18. It is easy to see the beginning of things and harder to see the end. It is also easier to write about things that have long passed and are illuminated in the twilight of retrospection. My time at college has neither ended nor been reflected upon. Despite our relatively short 14-week semesters, I experience Bennington as one big chunk of time. Albeit the respite of extended periods away from the campus, the calmness of reflection does not have time to settle in. Coming back every term I know that whatever resolutions I made while away will dissolve after two weeks into the routine of classes, meals and meetings. I have heard some alumni reflect on their time at Bennington as a collection of various chapters, each defined by a location such as a room, house, or academic building where they remember being the most as well as the people they associated with. The chapter breaks are sometimes narrated as drastic external or internal changes. Other times the changes are subtle but still memorable. Often the story follows a narrative arc that intertwines itself with the institutional narrative where a student arrives confused and uncertain, then through a series of classroom experiences over the course of four years is pushed to dig into the inner workings of their soul in order to find purpose and direction in their work. This narrative allows us to assume that the work produced by students is more authentic because it came from a unique personal process and in the absence of regular, quantitative, classroom evaluations it also serves the purpose of “proving” that this educational model works; desirable transformation happens at Bennington. I take issue with both assumptions for the simple reason that they both undermine the effect of society on the individual. How can we conclude that students admitted to the same institution from relatively similar class, race, gender and political backgrounds, will experience unique transformations? If the institution seeks students from varied backgrounds, how can we assume that the transformative processes that have been charted out for those who came before them will still be desirable to them? Let us say that you disagree and find that the institutional narrative to allow for more variation than I give it credit for, then why does this narrative of progress and self-discovery remain so dominant? Why do we perceive ourselves as a community of individuals? Why is it difficult to produce collaborative work unless the nature of the subject demands it? Why are there no joint Plan essays? After the speech I walked around with a graduate who had always assumed that, due to some fault of his own, he was not able to get the most out of his time at Bennington. He had concluded that since he had not accomplished this grand narrative arc of linear, individual progress and never saw the light at the end of the tunnel, which everyone seemed to speak about, that he must have failed. This speech, however, made him feel liberated in some way, and over the course of the following months he came to understand that while for some this narrative might be real, it certainly isn’t for most. He did not fail to achieve this phantom experience. For him, this articulation of a non-linear narrative was the beginning of reconciling his experience of the institution with how he imagined it should be. This is still how I conceive of Bennington. Even though I now have a much richer vocabulary and a wide body of theory to draw upon in order to give legitimacy to these intuitive feelings (which were not taken seriously at the time), I can say that not much has changed. I still feel like the world and society is missing. After the presidential campaigns, I also began to see that the rest of the country is missing. In that first reflection essay I asked myself how this place is going to change me. What needs will I feel and what desires would be fulfilled. I came to Bennington with a clear idea of what I wanted: A right to the education that had been previously denied to me, an education that nurtured me instead of trying to tame me into submission. Little did I know that this meant giving up all the other types of nurturing that I didn’t know I needed, because I had never had to do without: communal living, an understanding of difference based on class, mobility, access to the variety of people and possibilities in an urban center, and, most of all, a place to put my stuff down without having to leave in 14 weeks. My greatest need at Bennington has become a symbolic one. I want a bookshelf where I can have volumes of books that span the different stages of my life and questions I asked at the time to these authors. Instead I settle for a word document with a list of titles that I would have on MY BOOKSHELF.